– Synchronous motor required DC excitation to its rotor. – It is not self starting. – Power factor can be changed from lagging to leading and vice versa. – Speed of synchronous motor is constant at all load. – Synchronous motor rotate because of magnetic locking between rotor poles and stator poles. – Synchronous motor cost is high and required regular maintenance. – Induction motor always run less than synchronous speed. – Induction motor does not require any extra DC excitation source. – It is self starting. 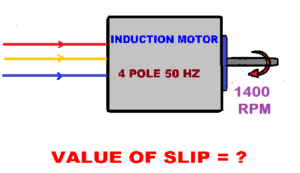 – Induction motor always operates at lagging power factor. – When the load on induction motor increases its speed decreases. – Three phase induction motor operates on induction principle. – It is less costly and require less maintenance. An alternating voltage is generated in a single conductor or armature coil rotating in a uniform magnetic field with stationary poles. An alternating voltage will also be generated in stationary armature conductors when the field poles rotate past the conductors. Thus, we see that as long as there is a relative motion between the armature conductor and the field flux there will be a voltage generated in the armature conductors. In both the cases wave shape of the voltage is a sine curve. In DC Generators, the field poles are stationary and the armature conductor rotate the voltage generated in the armature conductor is of alternating nature. This generated voltage generated alternating voltage is converted to a direct voltage at the brushes with the help of computer commutator. AC generators are usually called alternators. They are also called synchronous generators. Rotating machines that rotate at a speed fixed by the supply frequency and the number of poles are called synchronous machines. When the rotor is rotated by means of some prime over the armature conductor cuts the magnetic flux therefore and emf is induced in the armature conductors due to electromagnetic induction effect when the conductor is opposite the neutral plane induced EMF in it is minimum because flux density is maximum there when the conductor is opposite the middle off the pole, emf induced in it is maximum. The direction of induced emf depends upon the name of the poles influencing the conductor at any given instant does an alternating emf is induced in the conductors which goes through one complete cycle in angular distance equal to twice of the pole pitch. Three phase induction motor is the most common popular type of AC motor. It is very commonly used for industrial drives since it is cheap, robust, efficient and reliable. It has good speed regulations and high starting torque. It requires little maintenance and has a reasonable over load capacity. Poly-phase induction motor is considerable the most widely used AC motor. It is different from other type of motor because there is no electrical connections from the rotor winding to any source of supply. Then necessary voltage and current in the circuit are produced by induction from the stator winding. That is why it is called an induction motor. The induction motors essentially consist of stationary path known as straight and revolving part known as rotor. Stator: Stator of an induction motor is similar in construction to that of 3 phase synchronous alternator. In polyphase induction motor stator winding is usually arranged for three phase power supply. The face of which better design for the particular machine it is wound for a definite number of poles as per requirement of speed. Rotor: The rotor employed in a three phase induction motor may be any of the two types namely scale case or bond rotor type squirrel cage and wound rotor type. Squirrel cage induction motor: Almost 90% of induction motors are provided with squirrel cage because of its very simple robust and almost instructible construction .The rotor of a squirrel cage induction motor is constructed of a laminated core with the conductor placed parallel parallel to the surface of the core. Wound Rotor: As the name indicates, such rotor is wound with an insulated winding similar to the rotor winding and for the same number of poles as that of stator the rotor winding is always three phase winding even when the screen is found for 2 phase. The winding is made in slots and connected to first forest bronze slip ring at one end and the rotor shaft. In direct current motor current is drawn from the supply and conducted into the armature conductor through the brushes and commutator the armature conductor carry current in the magnetic field established by the field circuit, a force is extracted on the conductor which can move them at right angle to the field. Though in an induction motor, there is no electrical collections to the rotor but current induced in the rotor circuits and therefore the same conditions exist as in the DC motor i.e. the rotor conductors carrying current in the magnetic field and thereby have a force exerted on them which tends to move them at right angle to the field. Find the value of slip? Therefore, value of slip is 0.066 or 6.6%.